The building that houses Hostal Errota has been the headquarters of several companies. In the 1920s, the building belonged to the French cork company Ramoncín, currently located in Logroño. That company moved initially from Durango to Tolosa after the Civil War, and that was when Mrs. Rosario Imaz started a mill named Undagoitiakoerrota: Undagoitia was the name of the house, and "errota" means mill in Basque. For this, she used the water channel left by the cork company. That mill remained active for about 20-25 years, approximately. Since there were post-war times, the food shortage was notable and the production of wheat and corn from neighbouring villages was also low. However, thanks to the good relationship that Rosario Imaz maintained with the governor of Valladolid, the mill of Undagoitia worked well and prospered. Precisely, that mill in Durango was the only one that remained open during the postwar period in Vizcaya. Some characteristics of the building are a sign of that wealth: the channeling of robust walls, the garden and the walk in front of the house, among others. Rosario Imaz died fortuitously, run over by the train as it passed through San Fausto, in Durango. Since then, the mill remained inactive until an industrial bakery was opened in the building, which did not last long. Later, the Undagoitia house hosted a cow farm. In 1975, the building became a modern gymnasium that included tennis, squash and even paddle courts. In May of 1999 we decided to buy the building, and major renovations were carried out. From the beginning, there was no doubt that, due to its heritage value, the structure of the mill had to be preserved. 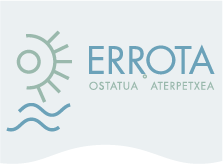 Thus, after a great effort, in 2000 we managed to open Hostal Errota. It should be noted that, in 2006, this building was one of the proposals to be included in the General List of Cultural Heritage of the Basque Country. According to experts, its greatest value is that it was technologically a pioneer in its time. What had once been a gym was remodelled; all the machines were renewed and a new gymnasium was opened, which was called Kirol Errota and, currently, it is used as a complement to the guesthouse. On the third floor, Hostal Errotagaina was created, since it was notable that in Durango there were too few guesthouses or hostels. The guesthouse has got 9 rooms, of which two are provided with a single bed, and seven are double. All of them have their private toilet and television, and are properly conditioned, since they have been recently renewed, in the summer of 2016. The largest groups are accommodated in the fourth floor, that is, in the hostel, which is specially designed for groups, such as theater, dance, music or sports groups that come to our region. The hostel is composed of two large rooms and can accommodate up to 20 people. During the last years, the hostel has received a lot of people, among which there are also some famous people, like well-known music groups, professional pelotaris from all over the world (Bolivia, Venezuela, Chile and Argentina), farmers of different nationalities members of the movement Vía Campesina, actors and writers, among others.